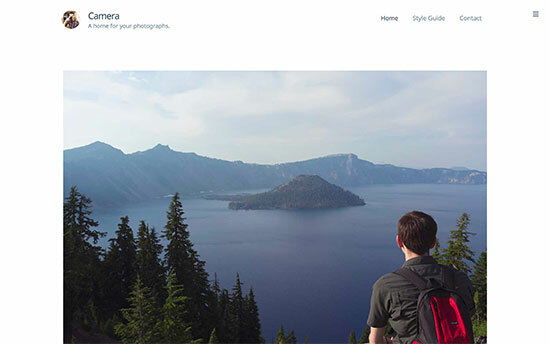 Are you looking for WordPress themes for photographers? A WordPress theme designed specifically for photographers can help showcase your work, find more clients, or connect with other like minded photographers. 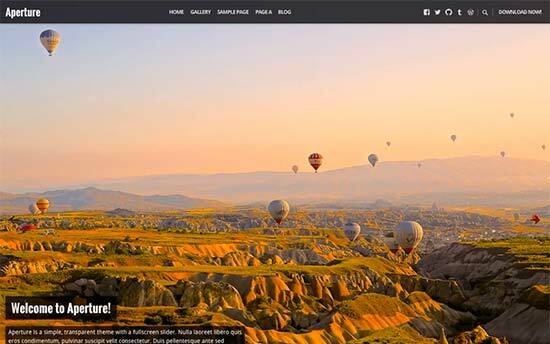 In this article, we have hand-picked some of the best WordPress themes for photographers that you can install on your photography website. First you need to make sure that you are choosing the right platform to build your website. Self hosted WordPress.org is the perfect platform for photographers. WordPress offers creative freedom with unlimited designs, thousands of apps, extensions, and integrations available to WordPress site owners. To get started, first you will need to sign up for a WordPress hosting account. All websites need hosting. It is your website’s home on the internet. You will also need a domain name. This will be your website’s address on the internet (for example, wpbeginner.com or google.com). We recommend using Bluehost. They are one of the largest hosting companies in the world and official WordPress hosting partner. After signing up for a hosting account, you will need to install WordPress. Follow the instructions in our guide on how to start a WordPress blog and you will be up and running in no time. Next, you need to choose a theme from our expert selection below. If you need help installing the theme on your site, then check out our beginner’s guide on how to install a WordPress theme. 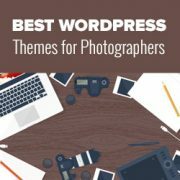 Having said that, let’s take a look at some of the best WordPress themes for photographers that you can install on your website. 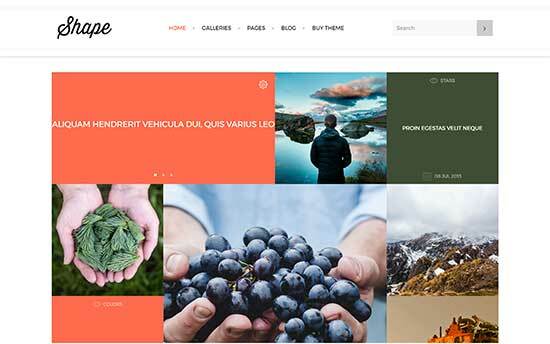 Note: All themes in this list are mobile-responsive and compatible with popular WordPress gallery plugins such as Envira Gallery. This list contains both free and paid themes. Candid is an awesome WordPress theme for photographers. It comes with a two column layout, large images, and graceful mobile responsive design. With its minimalist design approach Candid makes your photos pop out. It doesn’t ignore the text part of your website. It comes with beautiful typography featuring Abril Display, a clean and sophisticated serif font. 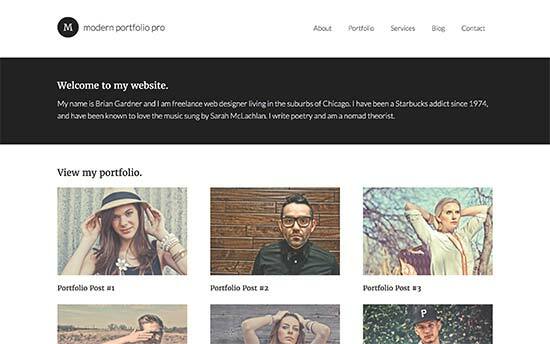 Modern Portfolio Pro is a WordPress portfolio theme for photographers, designers, and artists. It is built on top of the rock solid core of Genesis theme framework. 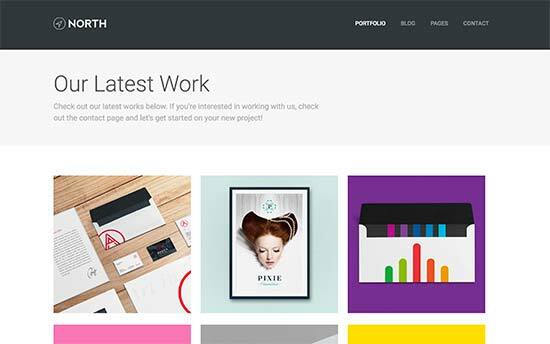 Modern Portfolio uses minimalist approach to design with a focus on gorgeous display of photos. It comes with page layouts for blog, homepage, and landing pages. It is easy to setup using the live theme customizer. 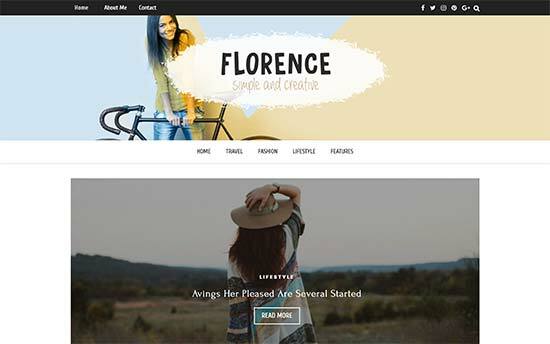 Florence is a beautiful WordPress multipurpose theme suitable for fashion photography and lifestyle websites. It comes in 5 ready to use layouts, with a powerful theme options panel. It uses large features images allowing you to beautifully showcase your photographs. It also comes with a built-in slider and gallery templates with tons of shortcodes to add different elements inside your posts and pages. 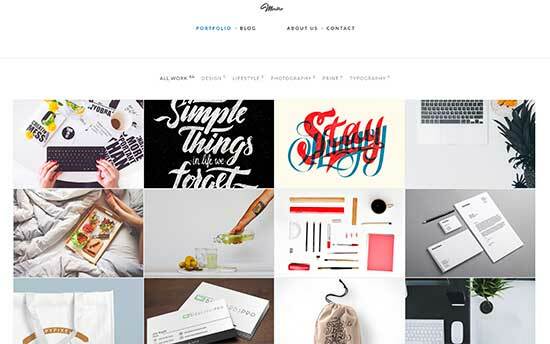 Verb is a modern looking WordPress portfolio theme for photographers, illustrators, and artists. It uses bold and elegant typography and gracefully adjusts itself for all screen sizes and devices. 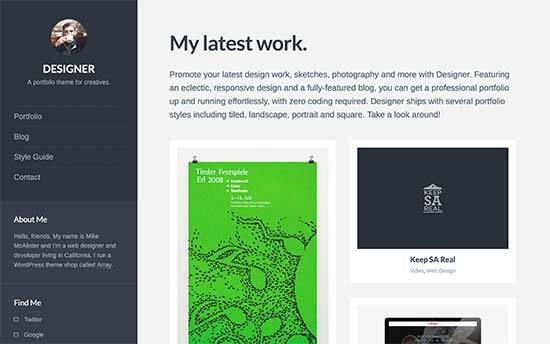 It includes a portfolio template to beautifully showcase your work. It is easy and simpler to setup using live theme customizer. Martho is a WordPress multipurpose theme suitable for bloggers, photographers, and artists. It comes with multiple homepage designs, and multiple templates for blog, project pages, galleries, etc. Martho is WooCommerce ready and has portfolio post type built-in with multiple display options. It also comes with a drag and drop page builder. 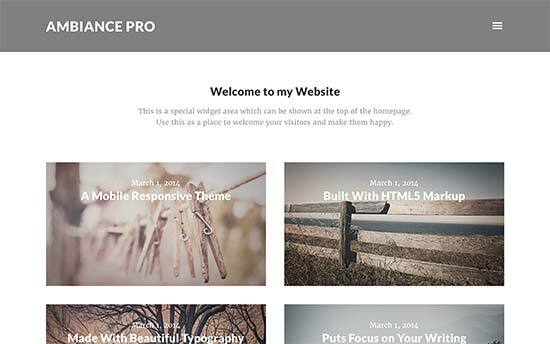 Ambiance Pro is a WordPress theme for photographers to create beautiful portfolio and photography websites. It is built on Genesis theme framework and comes with beautiful layout choices and elegant typography. It features a widgetized homepage layout and comes with multiple page templates for your blog, archives, and landing pages. Camera is a minimalist WordPress theme for photographers. It comes with built-in gallery carousels with large image display, fully mobile-friendly and responsive layout. Camera offers a distraction free viewing experience to your users with collapsible sidebars and menus. It comes with beautiful typography, quick and simple customization, and a getting started dashboard. This beautiful WordPress blogging theme comes with a built-in portfolio, large header images with call to action buttons, and a modern layout. Selkie is full of options, it comes with two layout types, multiple menu styles, 10 different blog layouts, and much more. It also comes with full support for WooCommerce, a drag and drop page builder, and live theme customizer. Coastline is a uniquely designed WordPress theme for photographers. It comes with portfolio section to easily display your photos. It also comes with powerful custom widgets, and multiple layout choices. 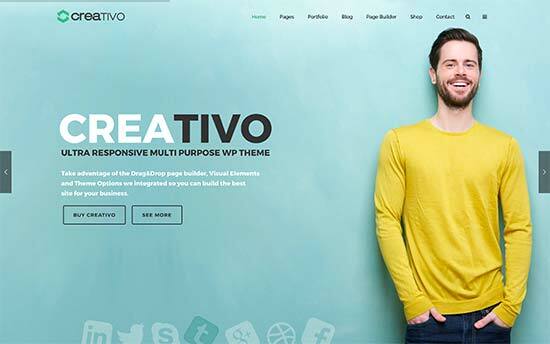 Creativo is a WordPress multipurpose theme suitable for business, blogging, and photography websites. It comes with built-in portfolio content type and full WooCommerce support. It comes with 7 skins, 3 design layouts, multiple header layouts, and unlimited color choices. It ships with page builder, slider, and a live chat plugin as well. 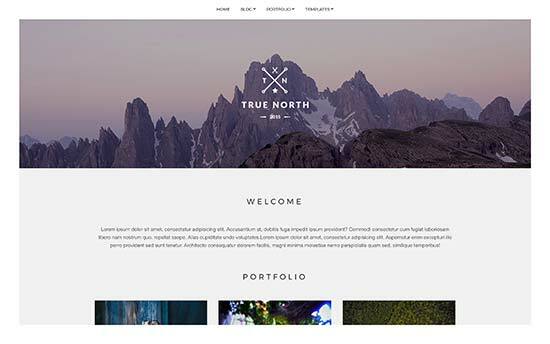 True North is an elegant WordPress theme suitable for photographers to build portfolio websites. It comes with a built-in portfolio section where you can easily upload your photos. The homepage features a grid layout prominently displaying your photos. It supports custom backgrounds, large headers, and comes with custom widgets for social media profiles and content discovery features. 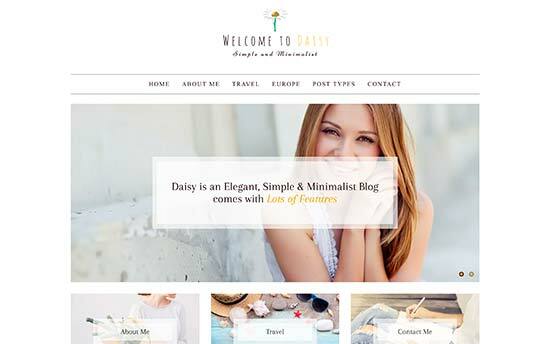 Daisy is a minimalist WordPress blogging theme suitable for photographers and travel blogs as well. It comes with a beautiful homepage layout allowing you to showcase your featured content in a slider and link boxes. The blog page comes with multiple layout choices. You can also choose multiple header and menu layouts. It comes with beautiful gallery style, unlimited colors, and live theme customizer support. 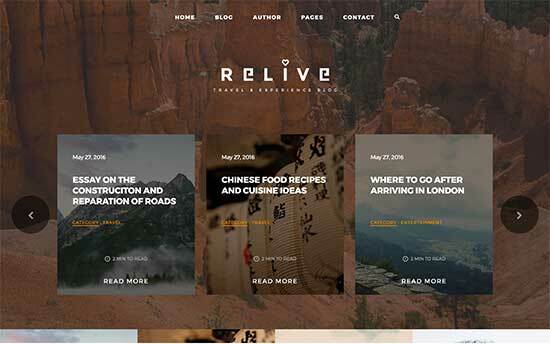 Relive is a stunningly beautiful WordPress theme for photographers and storytellers. It is designed to created an immersive experience with the help of audio, video, images and text. It works great with long form content with beautiful scrolling effects. 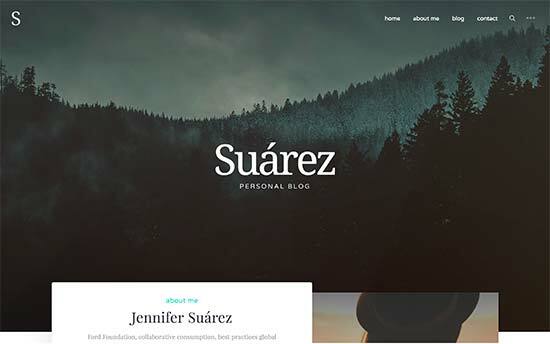 Suarez is a WordPress photo blogging theme with a gorgeous design that makes your photos popout while not ignoring the text and other form of content. It comes with a ton of customization options and a drag and drop page builder. It comes with beautiful CSS animations, Google Fonts, and a beautiful slider. Suarez is easy to set up with a live customizer panel. 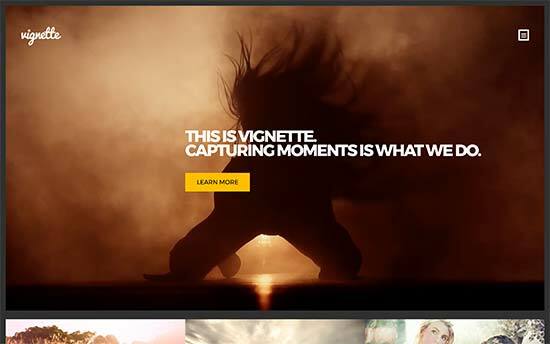 Vignette is a modern WordPress theme for photographers and video makers. 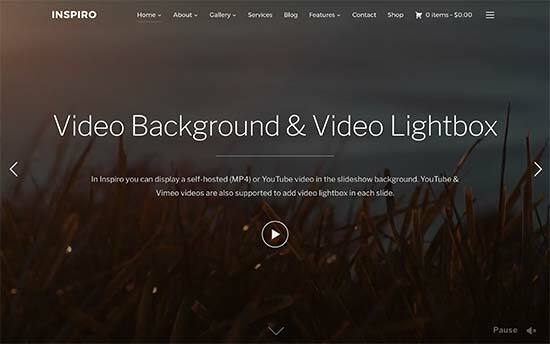 It has a large header where you can use a video as background or an image with call to action buttons. It comes with gorgeous gallery templates to display your photographs and videos. It has flexible customization options with multiple layout choices, colors, and custom widgets. 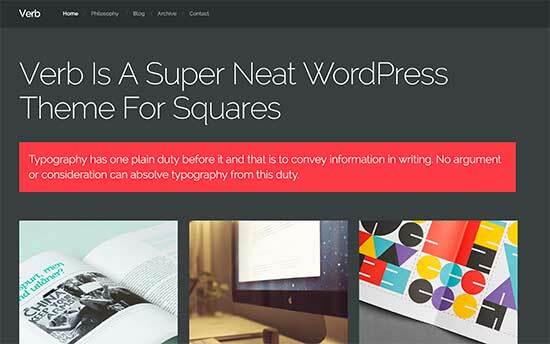 Shape is a WordPress theme designed specifically for photographers. It comes with built-in filterable galleries with beautiful transition effects. It also comes with sections to add your services, portfolio items, clients, team members, etc. 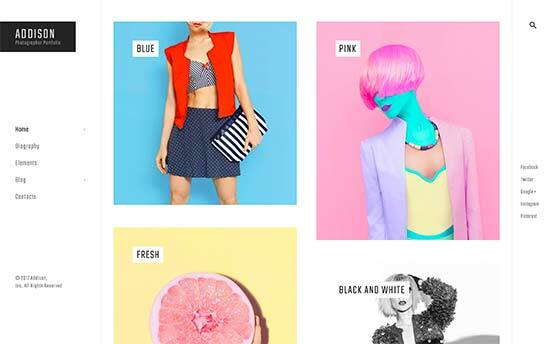 Theme’s homepage features a grid layout which prominently displays your photos. The single post and page, gallery and portfolio items have their own unique templates. Designer is an elegant WordPress portfolio theme for photographers, designers, and artists. It features a beautiful homepage with two column layout on desktop, and a single column layout on mobile. It’s minimalist approach to design offers a distraction view and more engaging view to showcase your portfolio items. It comes with a collapsible sidebar, crisp typography, and a simpler quick setup to get you started right away. 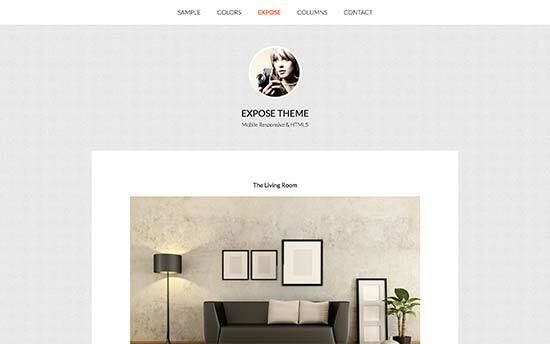 Expose Pro is a beautifully designed WordPress theme for photographers. It comes with a widgetized homepage with four widget areas and has multiple templates for your blog, homepage, archive, and landing pages. It has a custom gallery post format with lightbox popup of your photos. It uses large featured images to showcase the best of your work. Expose is extremely easy to setup and ready to be used right out the box. 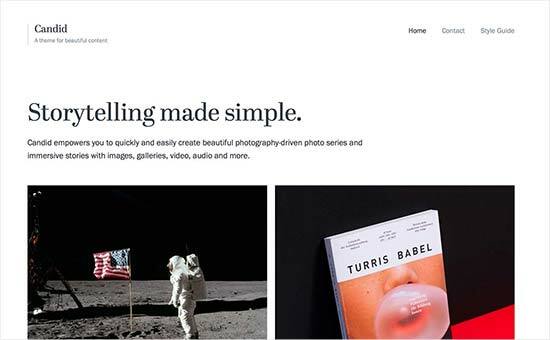 North is another elegant WordPress portfolio theme for photographers with a minimalist design approach and a grid layout. It comes with beautiful portfolio templates to display portfolio items like images, photos, videos, and audio files. 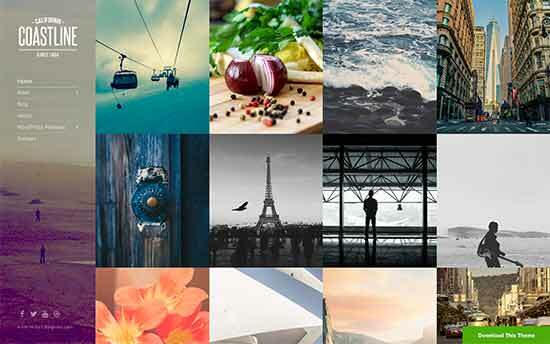 It comes with multiple color choices, supports posts formats, and can be used with third party photo gallery plugins to create beautiful galleries. Memories is a stylish WordPress theme for fashion and lifestyle photographers. It comes with a gallery display to showcase the best of your photographs, designs, and other artwork. It has multiple color schemes and layout choices, with custom widgets to add social media and content discovery features to your theme. 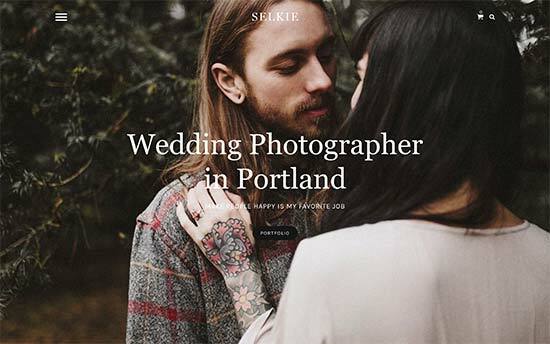 Aperture is a free WordPress theme for photographers. It comes with a gorgeous fullscreen slider on the homepage allowing you to display your photographs in their full glory. It comes with fullscreen background, large featured images, and beautiful gallery style. It is also quite simple to setup and very easy to customize using live theme customizer. 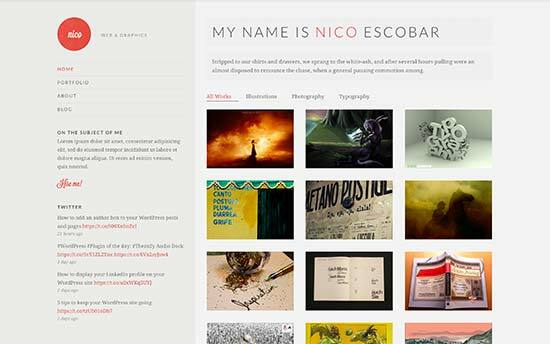 Nico is a beautiful WordPress photography theme which comes with a filterable portfolio section. Perfect for photographers who want to build an engaging portfolio website to showcase different aspects of their work. Nico comes with multiple color schemes and has support for custom backgrounds, headers, widgets, etc. It is easy to customize and comes with flexible options. 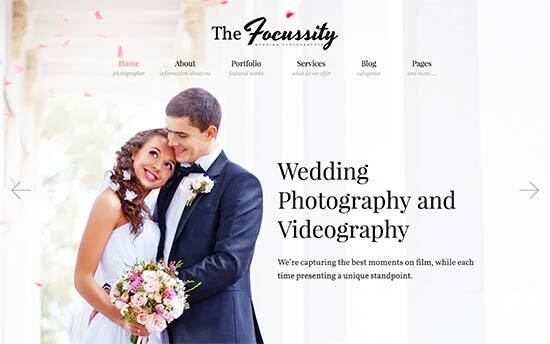 Focussity is a beautiful WordPress theme for wedding photographers. It comes with portfolio and beautiful image galleries. It supports fullscreen header images and backgrounds. It also comes with a drag and drop page builder to create your own layouts. Focussity is multilingual ready and comes with beautiful parallax effects and background video support. 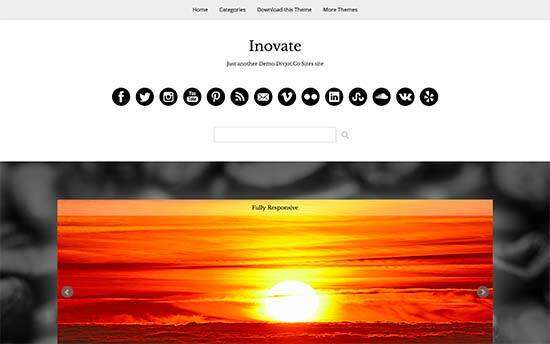 Inovate is a free WordPress theme for bloggers and photographers. It takes the minimalist approach to design focusing on large display of featured images and beautiful typography. It comes with a large header, custom background, and live theme customizer support. 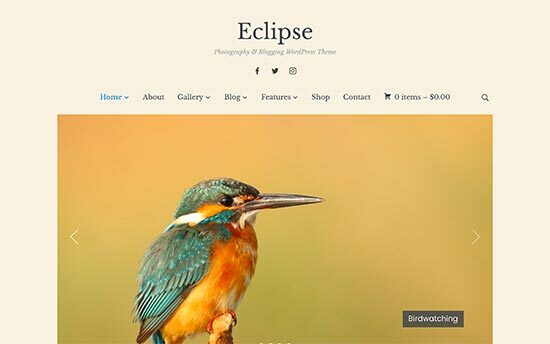 Eclipse is an elegant WordPress theme for photographers and bloggers. The homepage features a beautiful slider showcasing your latest work, followed by link blocks to important pages, and then your recent posts in a grid. It comes with a beautiful custom widget for Instagram photos and videos. It also has beautiful gallery templates, portfolio section, and is fully compatible with WooCommerce. 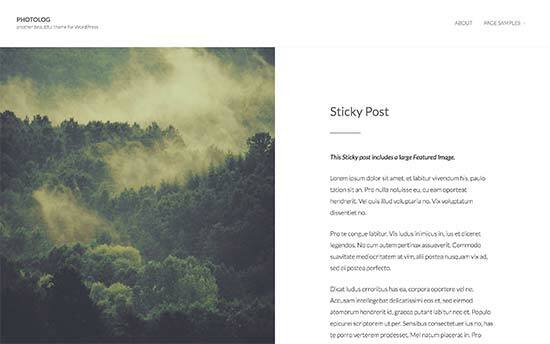 Photolog is a free WordPress theme with alternating ‘sticky’ featured images for bloggers, photographers, and writers. The homepage features a unique two column layout with featured images switching columns for alternate posts. This creates an engaging user experience and makes your photos popout. 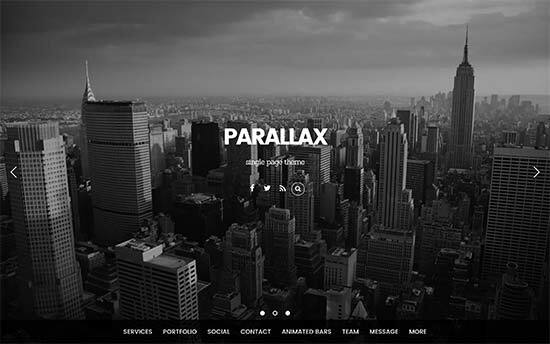 Parallax is a modern WordPress portfolio theme for photographers. It comes with tons of customization options and 40 predesigned layouts. It also comes with an easy to use drag and drop page builder. As the name suggests, it comes with graceful parallax effects and fullscreen slider, image and video backgrounds. Extant is a minimalist free WordPress theme for photographers and designers. It features a clean and simple layout putting your images first. It supports third party plugins to showcase and even sell your work from your website. It offers a distraction free viewing and reading experience with collapsible menus. The homepage comes in two layouts landscape and portrait. Addison is a stunningly beautiful WordPress portfolio theme for photographers. It features a modern elegant design that puts your projects on the frontpage. It comes with a built-in post type for projects with multiple layouts. It supports unlimited colors and live customizer. It also comes with custom widgets for social media and content discovery features. This uniquely designed WordPress theme is created specifically for photographers and bloggers. 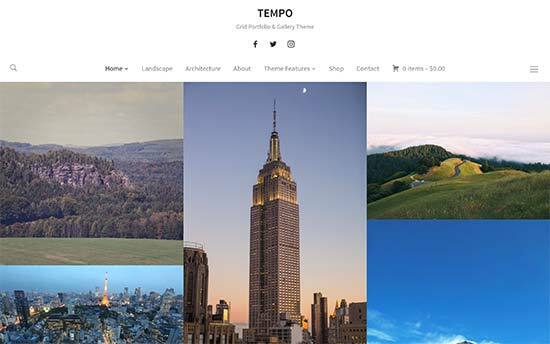 Tempo comes with a homepage featuring a grid of your photos. It comes with 2 light and dark skins and allows you to change image orientation portrait, landscape or square. It comes with three header layouts, social profiles menu, and full screen images in posts. It is WooCommerce ready and comes with quick and easy setup with live theme customizer. 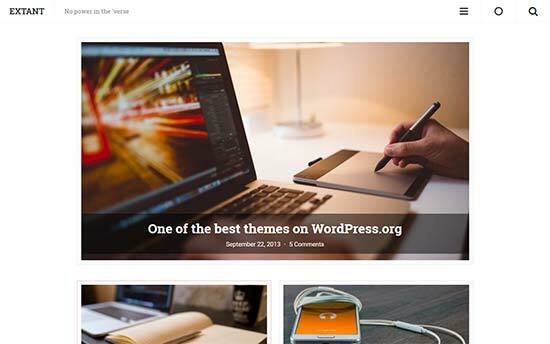 Inspiro is a beautiful multi-purpose WordPress theme. It comes with beautiful fullscreen video backgrounds, a powerful portfolio section, and a gallery module. It has unique custom widgets to display portfolio showcases. It comes with four unique templates and a drag and drop page builder. It also has video lightbox allowing users to watch videos in a popup for a more immersive user experience. 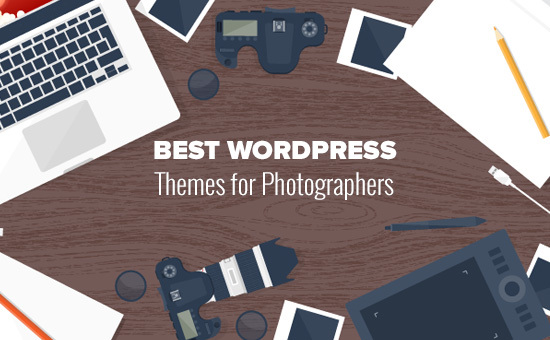 We hope this article helped you find the best WordPress themes for photographers. You may also want to see our list of 17 best WordPress plugins for photographers. I Want to create a listing website for photographers with reviews with word press theme. Could you please suggest one good theme. Hi, I really appreciate if you could add tutorial on how to add hreflang to website according to Google.